Click HERE to access my TPT account for additional lessons, rubrics and resources. to direct the construction. Using fractions children will divide the clay into 1/2 and 1/4 sections. Extend by illustrating the concepts of 1/2, 1/4, 1/8, 1/16 and 1/32 if age appropriate.​ Click HERE former information and the lesson. Ojibwe-African American Artist! Learn more about this extraordinary woman and create a relief sculpture basked on your interests. Explore the use of an all white modeling clay to mimic her use of Italian marble. CLICK HERE for the lesson plan. Subject is something the student is interested in! 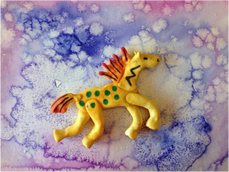 * Model Magic relief sculpture: Follow steps 1-4 and create a 2-D horse to mount on tag board, horse will not need to stand, students may add details onfront side only. Use a scissors to cut the mane and tail. This lesson uses the Smithsonian Web site for an introduction to Pueblo Pottery. After learning about the importance and meaning of the pottery symbols, students will design their own symbols for a clay wall vase. Explore web page site listed above. Do you think other’s can ‘read’ your symbol? Share with a classmate and refine as needed. On one shape, make your shape from coils or thin slabs of clay. Attach with scratch and wet technique. Join two pieces of clay together around the edges, use scratch and wet technique. Stuff inside of pot with newspaper. Poke a hole on the back pot shape to hang on wall. Let dry flat, the back should be flat on the table, the top slightly rounded. Older students could make a coil vase/pot. If you do not have access to clay or a kiln students could use paper or paint as well. You can also make a nice wall pocket using paper plates and paint. Be aware that all text and images on the Native American Activities website are Copyright Protected. You must obtain written permission to reproduce or transmit any NativeAmericanActivities materials.